Named for the long-serving Winnipeg teacher Oliver Victor Jewitt, this Seven Oaks School Division school was built in 1981-1982. 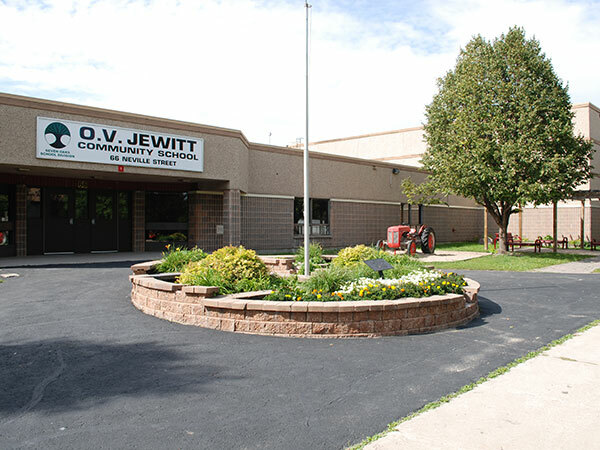 First known as O. V. Jewitt Elementary School, the facility opened to students in September 1982 and was followed with an official unveiling on 9 November 1982 with Mayor Bill Norrie in attendance. The school reached its capacity of around 540 students (kindergarten to grade 6) in about two years. In September 1992, in commemoration of the school’s 10th anniversary and the 125th anniversary of Canadian Confederation, the school’s Parent Teacher Liaison Committee constructed a flower bed surrounding the school’s flagpole at the main entrance. The school has since been re-designated as a Community School. A memorial on the school grounds commemorates former pupil Marie Irene Bilodeau (1998-2010). “Seven Oaks School Division No. 10,” Winnipeg Free Press, 7 November 1981, page 85. “Billboard [O. V. Jewitt elementary school], Winnipeg Free Press, 6 November 1982, page 24. “Board decision makes use of provincial busing grant,” Winnipeg Free Press, 21 April 1983, page 17. “O. V. Jewitt school takes steps to accommodate ethnic groups,” Winnipeg Free Press Weekly North Edition, 24 November 1991, page 3. “Playground a priority at O. V. Jewitt,” Winnipeg Free Press Weekly North Edition, 21 January 1992, page 3. “Officials hope illness contained,” Winnipeg Free Press, 1 December 1996, page A4. Obituary [Marie Irene Bilodeau], Winnipeg Free Press, 25 February 2010, page C8.